David met us bright and early a little before dawn at our Newton Abbott Premier Inn. This was to be the second of two one day courses organised by a keen member of the Leighton Buzzard Photographic Club. Teignmouth Pier provided a good subject for our ND filters and Start Point Lighthouse was good to practice our 'in the rain' technique. The tour continued to Dartmoor and a lunch stop at the excellent Widecombe in the Moor Cafe on the Green. Refreshed we mounted a minor attack on the Haytor peaks. The course concluded with a visit to the Haytor Red Barn. The snow showers added to the excitement but were we down hearted? David's course lived up to its name; landscape and travel. He included some really good instruction and tips for practising what were new techniques for many of us. He was always helpful and thoughtful about our needs and ran a very competent one day course. 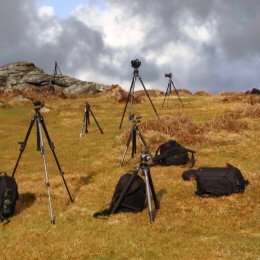 I have included some of my photos as examples of the work covered and would like to thank David and all my colleagues for their contribution to a memorable trip to Devon.